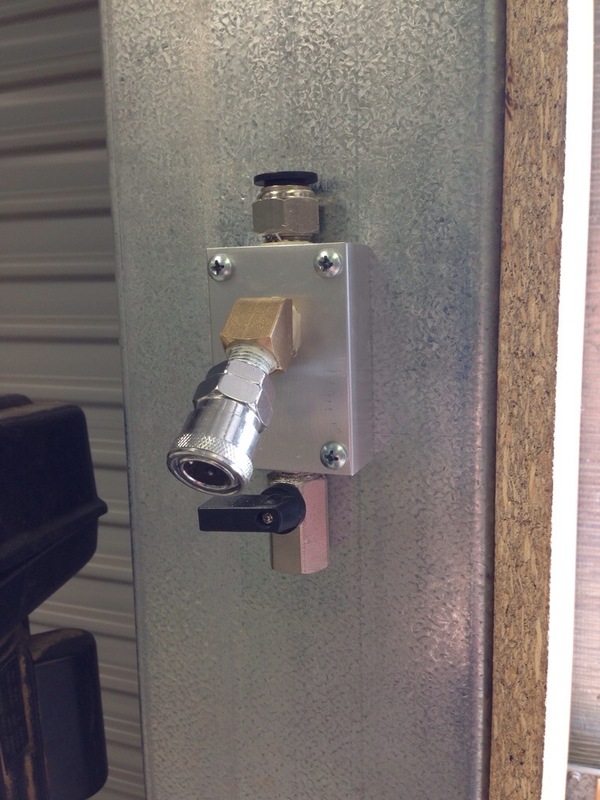 I was in the process of mounting the RapidAir outlets, which required pilot holes to be drilled for the screws (not self drilling unfortunately). It was taking ages- having to start on smaller and smaller drill bits, just to drill a 3.5mm hole. Ridiculous. So decided to stop being lazy, and continue working with something obviously blunt. Take the time, set up the Tormek, and the DBS22, and put a real edge on the bit. Back to drilling through steel like butter. All that extra time sharpening was saved in just the next 4 holes, and I still had 50 holes to go. Time spent sharpening pays off in spades. When I first made some scales for the steak knife set (from Professional Woodworkers Supplies) about a year ago, things were going well until almost the final step when excessive tearout occurred when the roundover bit got a tad aggressive. That project has been set aside for a little longer than I expected (or realised when I looked at the date of the first effort!). So time to try again. 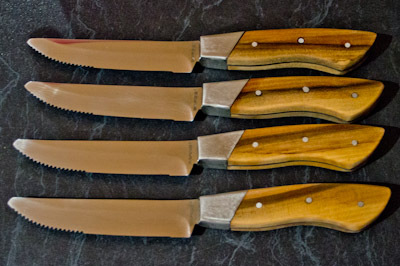 I’m not sure if this specific set is still available, but there are plenty of other knife projects available here. To start, I have a new timber for the blanks (for a bit of variety!) This time the handles will be black hearted sassafras. The blanks have been roughly sized, and ready to be machined accurately. 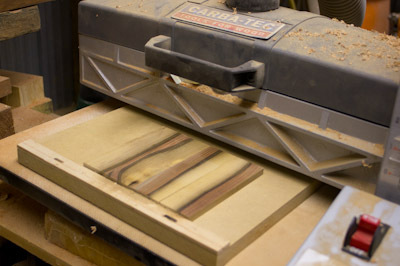 I have improved the method I use to sand thin stock on the drum sander by making a sled. 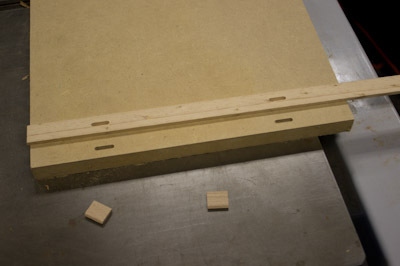 With a piece of MDF, I have attached a thin fence to one edge with a couple of 4mm dominos. 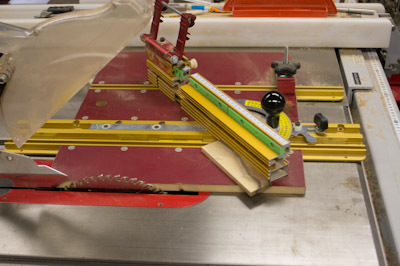 The sled carries the blanks in and through the sander – the increased area of the base works well with the sander to ensure no slippage occurs when the blanks impact the sanding drum, decreasing any chance of snipe or burning. These were sanded to 8.2mm to match the knife bolster. 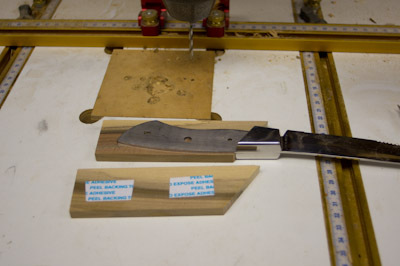 Next, cut an angle on one end to match the knife blank. In this case, 36 degrees, which is easily done using the Incra Mitre Gauge HD, and even better when coupled up with the Mitre Express. 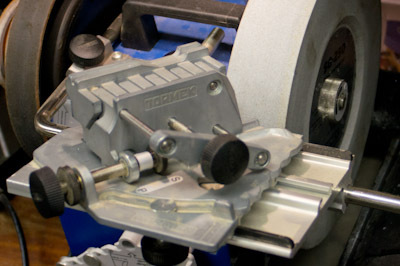 The Mitre Express makes machining small items safer, and minimising tearout. 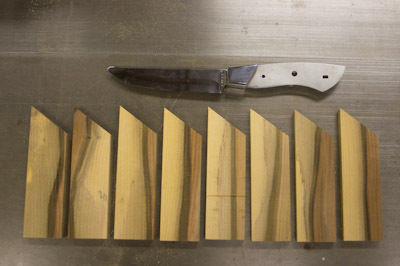 The resulting knife scales ready for the next stage. I needed to drill 3.5mm holes, but found my drill bit that size had the end snapped off from a previous job. So for a bit of a diversion, off to the Tormek and the drill bit sharpener jig. This jig quickly turned the broken tip of the bit back into a well-formed, razor sharp bit, better than new (originally a 2 facet bit – this jig allows you to develop 4 facets on the tip). With double-sided tape, I attached one scale to the knife, then the second scale to the first. This allows me to drill both sides simultaneously, and any breakout can be minimised. After drilling, I drew around the handle, then detached the knife. After roughing down on the bandsaw, I sanded right to the line using a combination of the disk sander and spindle sander. 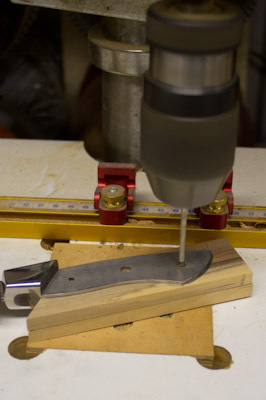 The scales are then glued to either side of the knife, and the pins inserted. They are longer than necessary, and get cut and sanded to size once the glue sets. The knives were then returned to the disk and spindle sanders to finalise the shape. From there, I used a random orbital sander to sand all sides, and round over the edges (done with the ROS held upside down in one hand, and the knife handle bought to the sander). After a while I decided the microcuts were becoming a bit excessive, so finished the job wearing a kevlar carver’s glove. 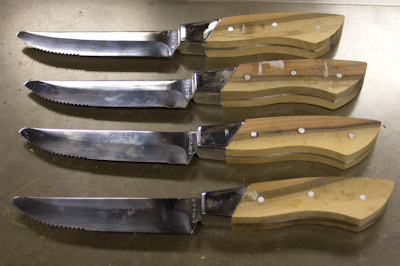 You may notice the knife bolsters are no longer polished – while shaping some of the bolsters got damaged unfortunately, so it was better to have them all sanded evenly to match. It may look a bit exaggerated in the photo, but ok in reality. Not the preferred result, but such is life. The knives have already been used a couple of times – it is rather cool using a knife you’ve made the handle for, and the knives themselves are heavy, very sharp and slice steak to perfection. Forgot to mention – they were finished simply by rubbing them down with Ubeaut Foodsafe Plus mineral oil. This is ideal for chopping boards, salad bowls, and of course, knife handles. (just reread this post the following morning- I really shouldn’t write entries at 2am: so many typos, including the title. “Sneak knives”. Either that is autocorrect gone mad, or I have! 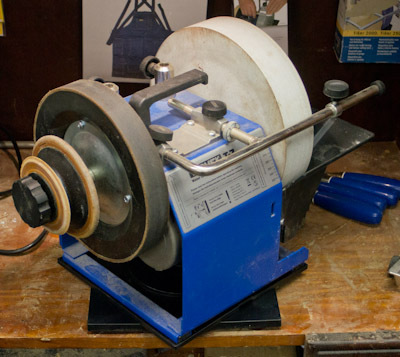 You are deep into a sharpening session on your water-cooled sharpener, and the next job would be best done with the wheel turning towards the edge, rather than away from it. What do you do? What DO you do? I know what I do – compromise! I know the T7 (in my case) weights 14kg, plus around 3kg in water (the wheel soaks up about 2kg, and there is an additional in the waterbath). I could pick it up and spin it around, then back again for each job, but I don’t. And I am not the only one. 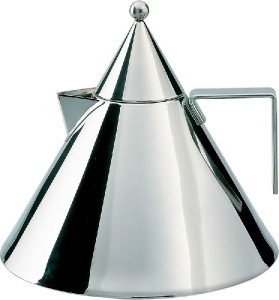 In fact, it must be rather common as Tormek have come up with the RB-180. 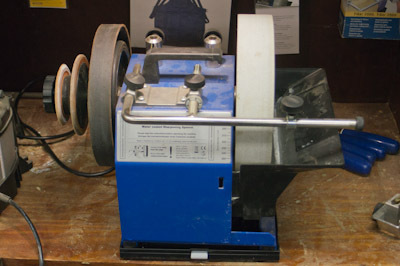 A rotating base for their sharpeners. 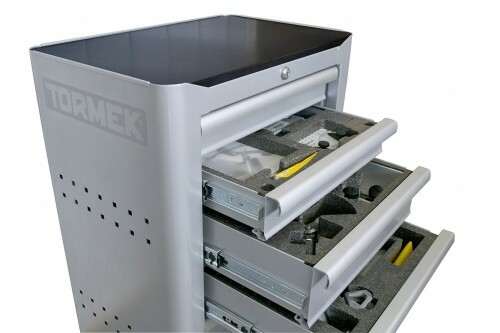 It is specifically designed for the Tormek footprint, and has rubber feet so the complete unit doesn’t start slipping around on the bench. I have found there can be a little movement between the sharpener and the rotating base. I may put down something a bit more anti-slip, but I didn’t notice it causing me a problem during my first sharpening session since putting the new base under my sharpener. 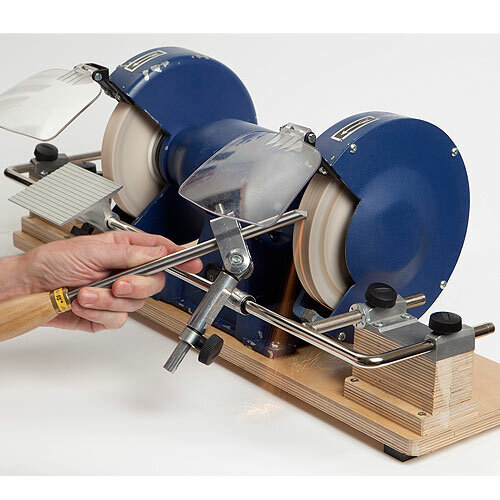 The rotating base has a very low profile – particularly important for those people who have already taken the time to ensure their sharpeners are set at the optimum height. 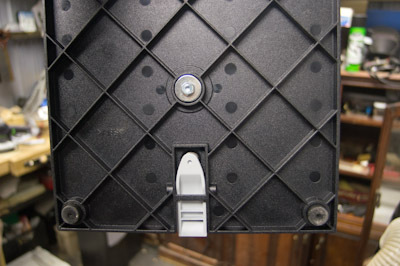 Looking at the underside for a sec, and you see those rubber feet, and the lock for the rotation. Also the cross reinforcing to provide stiffness. 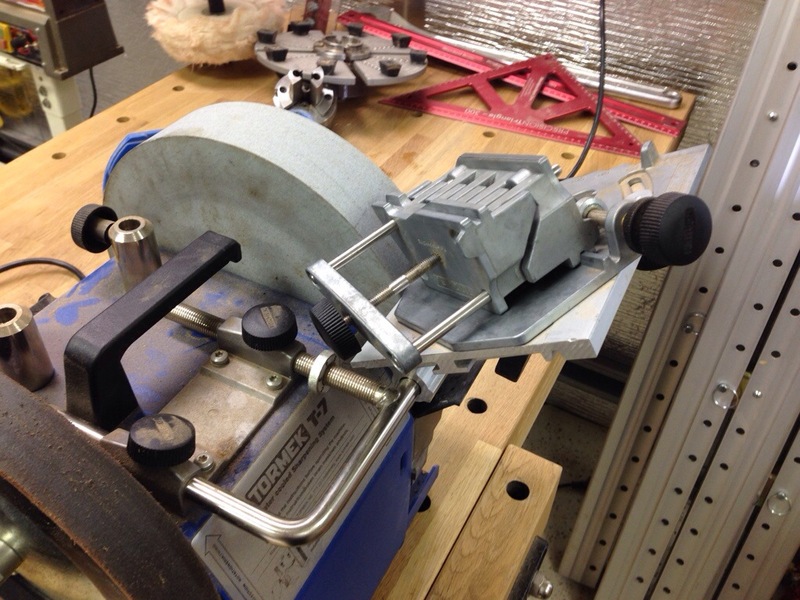 Fitting the base is just a bit easy – pick up sharpener, put down the RB-180 (with the lock facing the front), place the sharpener on top. Done deed. Simple push down on the locking lever, and spin the Tormek around. 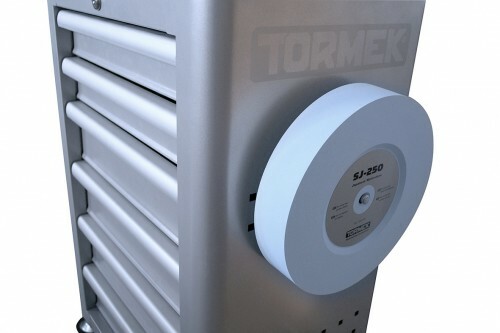 So a useful addition, particularly for the 17kg (wet weight) Tormek T7. 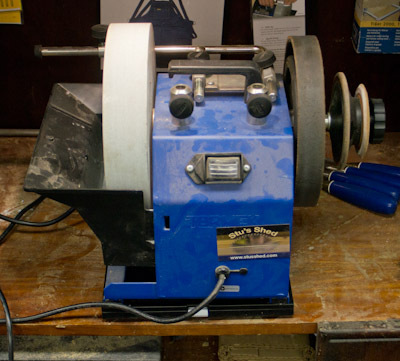 It has been a while since I’ve seen this side of the sharpener – looks like it is due for some dusting! I took the splash guard off for this, as where I have the T7 there isn’t a lot of room, and therefore even more reason for the new base. 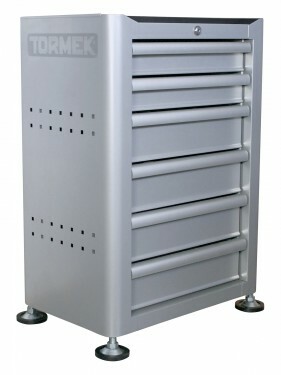 Check out http://www.promac.com.au for more information and to find an authorised dealer near you. First cab off the ranks for Summer is a bit of unlearning, then getting a day of turning instruction from a master turner. So that is going to be quite an experience! I’ve developed many bad habits as it happens. First things first however – I can’t take many of my turning chisels in their current condition, so have been giving them a decent sharpen, and there is only one way I know to achieve that: the Tormek T7. So what is the solution? Two other stones. One I use for HSS is the Blackstone Silicon Tormek wheel. 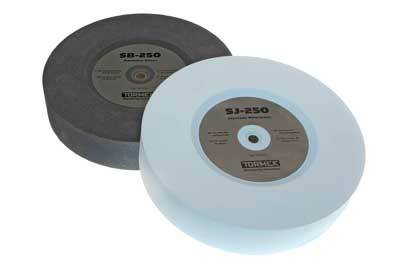 It is the same grit as the standard stone (220 grit), but it cuts HSS fast. 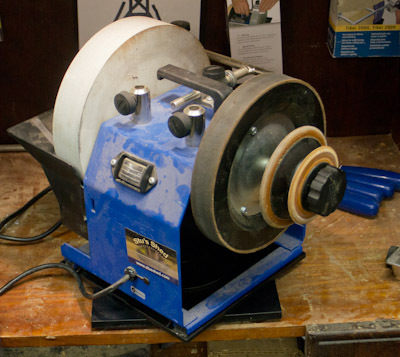 The other stone (and no, not the 4000 grit Japanese stone) is your everyday grinder with a Al-Oxide wheel. 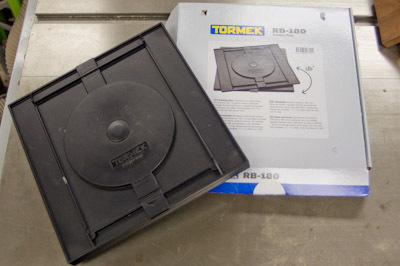 This can be used to do significant material removal before moving over to the Tormek. 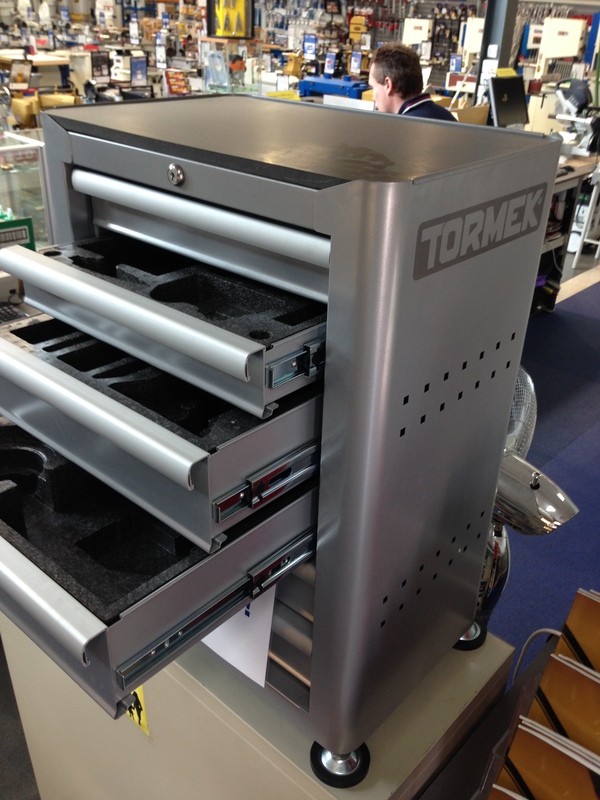 Now you might very well ask what is the point of having a Tormek if you are just going to use a grinder, and especially, how do you ensure what you grind off with the high speed grinder is right, and you don’t find yourself having to do a complete reshape on the Tormek anyway? 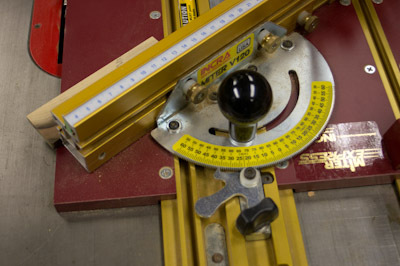 The simple answer is to treat the high speed grinder as if it is the Tormek, complete with using the same jigs and the same setup distances and angles. This is achieved by fitting the BGM 100 to your standard grinder. This kit includes a block mount and the standard Tormek arm which your normal collection of Tormek jigs will obviously fit. After a light shape (given how aggressive the wheels cut, you don’t need more than a light touch), you can then return to the T7 to finish the job, without excessive wear of the wheel. As far a heat buildup from the high speed grinder – you don’t need excessive force, and don’t rush what will work very quickly anyway ensures you don’t burn the steel. Back on the T7, and the choices are standard wheel, the Blackstone Silicon (at the rear) and the Japanese stone (in the foreground). That is one soft wheel!